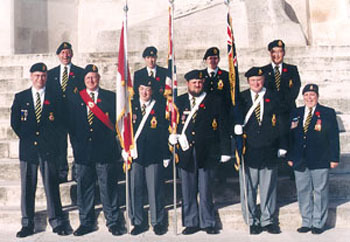 Standing at the Vimy Memorial in France, the youth leaders are: (front, from left): Marcus Munro of Elkford, B.C., Keith Raike of Deer Lake, Nfld., Louise Chapdelaine of Waterloo, Que., Lester Davison of Kensington, P.E.I., Mark Christiansen of Thunder Bay, Ont., Andréa Villeneuve of Timmins, Ont., (rear) Terry Brideau of Val-Comeau, N.B., Marina Clayton-Theriault of Windsor, N.S., Kathleen Salt of Slave Lake, Alta., and Leo Twerdin of Iqaluit, Nunavut. 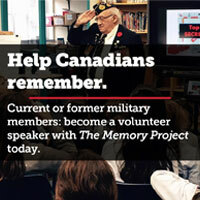 In its continuing quest to spread the concept of remembrance to generations untouched by war, The Royal Canadian Legion has over the years developed some valuable tools that generate personal involvement in remembrance.The most prominent is the poppy, symbol of both remembrance and the annual poppy campaign that strikes a chord with the Canadian public and raises funds in support of veterans and others who have served. Another useful tool is the annual literary and poster contest in schools nationwide. But, for an intense level of personal involvement, nothing tops the Legion’s Youth Leaders Pilgrimage of Remembrance to World War I and II battle sites, memorials and war cemeteries in England, France, Belgium and the Netherlands. The 2001 pilgrimage from July 5-19 was led by Dominion Vice-President Clarence King, chairman of the Leadership, Development and Youth Committee. The 10 pilgrims were all adults age 40 or younger who have some involvement with youth. Each was selected by his/her command and is expected to prepare a presentation and speak to various groups. “If you’re going to be one of the preachers of remembrance, you have to experience some of it and this is what we’re doing with the pilgrims,” King explained. “They are here to learn and hopefully communicate their experiences…to the people back home and further our program of remembrance…. As time goes, as we go farther down the road, we need this walk down history lane where things took place so that we can preach the gospel of remembrance…. Designing a trip like this presents many challenges for there’s almost no end of places to go and things to see, but Goheen achieved the difficult task of developing a balanced itinerary. The pilgrimage did a great job of getting off the main highways and onto the byways of history, particularly in northern France for WW I and Normandy for WW II. At each major site, Goheen provided an orientation for the pilgrims. Take our visit to Verrières Ridge in Normandy, France, scene of a major battle in July 1944. Goheen said, in part: “The high ground in this area was the Canadian 2nd Division’s objective in General (Bernard) Montgomery’s overall plan to break out towards Falaise and, if possible, divert German attention and resources from the American breakout to the west. “Operation Spring was the name for the initial phase of the breakout and this ridge was to be taken on the first night. Part of the plan called for St-Martin, St-Andre and May sur Orne to be secured and a start line determined for the attack on the ridge proper by the Black Watch. “With reports that these villages are cleared, the Black Watch move towards their start positions on the night of July 24 but find that the Germans are still very much around. Unknown to the Canadians, the ridge and surrounding villages, like St-Andre, where the Black Watch are to start, are honeycombed with underground tunnels from the many iron mining operations in the area. The Germans use these tunnels and are able to infiltrate small groups behind and into Canadian positions. “On the night of the 24th, the Black Watch lose their commanding officer and their most senior company commander when they enter St-Martin and come under enemy fire. The Black Watch had received reports the village had been cleared of Germans when they in fact had simply hidden in the tunnels…. “…Command of the Black Watch falls to 26-year-old Major Phil Griffin whose orders are to take the ridge the morning of the 25th. As H Hour approaches, Griffin’s start line is still under enemy fire from behind in St-Andre and St-Martin; the tanks which are to support his men are nowhere to be found…. Also powerful was the presence of two WW II veterans among the small number of paying customers. Charles McArthur, 84, of Cambridge, Ont., and Raymond Hughson, 83, of Manitowaning, Ont., each lost a brother in that conflict and each was returning to pay his respects. Their presence helped to personalize war for the youth leaders. Raymond Hughson, assisted by his son Lynn, placed a wreath at Bretteville-sur-Laize Canadian War Cemetery and visited the grave of his younger brother Pte. Eric Hughson: “Very, very touching. I managed to hold my tears back,” he said later. His brother was the baby of the family and Raymond joined up to protect him. “They called me Mark I and him Mark II,” he said. The two were privates in the same platoon in the Royal Hamilton Light Infantry, but Raymond was on another task when Eric was killed by machine-gun fire on Aug. 12, 1944, at age 19. The trip left an indelible impression on the pilgrims, who commented individually on their personal reactions. Louise Chapdelaine, 40, is secretary of Shefford Branch in Waterloo, Que. The marketing coordinator of Ski-Doo snowmobiles for Bombardier Inc., who is involved with the Navy League and sea cadets, said: “They don’t teach history in the schools anymore so that people can understand where they are today. I think youth who understand history are more involved in current events and they become better citizens.” She describes the challenge as one of combining history with a sense of duty, of civic responsibility” because “if you want the world around you to be a good one, you have to work at it…. Marcus Munro, 32, is a resident of Elkford, B.C., and a member of Fernie Branch. A cadet instructor and organizer of youth sports clinics, he was in the regular force and is now a coal miner. He said: “It’s a great experience, something I think that most people if they have the opportunity to do it they should go for it. If it means paying their way to come over and do this pilgrimage, then do it…. It increases your awareness of the sacrifice that took place and the willingness of these men, some young, some old, that believed enough in the cause to come over and put their life on the line and a lot of them left it there….